My husband and I went to a state fair last weekend and I was impressed to find a salad amongst the fried everything being offered. It was a very good greek salad with light cheese and dressing. 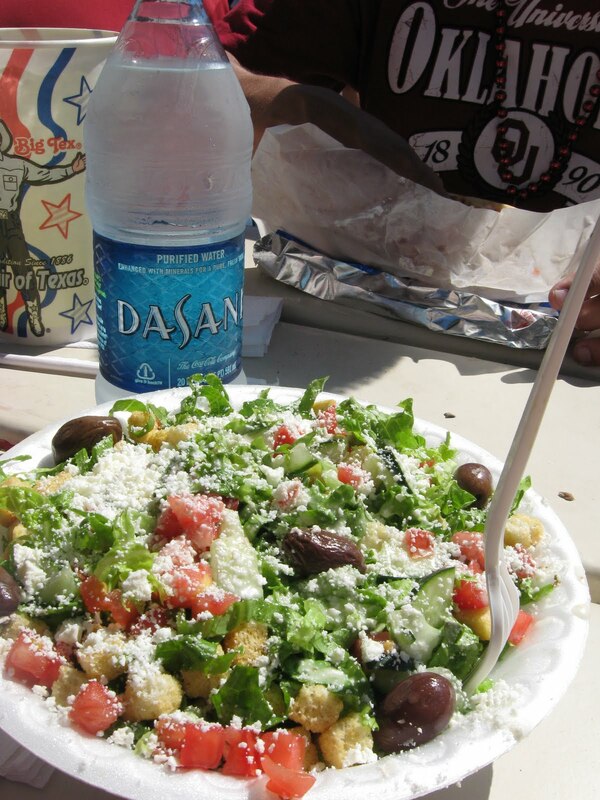 I can say that the smell of fried stuff wasn’t any more appealing than this yummy greek salad on that warm, sunny day. So, kudos to the people of greek food at the fair!!! Good for you for choosing a healthy item, and even better for the fair for offering one! A fellow hottie AND a SOONER! Sweet Lord I'm in love! Good job on finding one healthy food at the fair. That ain't easy. Check out my blog and my new OU lab coat! Boomer! That salad does look good! Sorry I can't cheer for the OU win, since I'm a gal from Texas, but I'll be a good sport and at least say congrats. 🙂 Oh, and I remember my husband and I used to go to the fair before we had kids, just so we could eat everything in sight! I haven't tested my willpower lately at a fair. Fried food on a stick – hard to resist!